For the beauty of the nature that surrounds it, for the proximity of the most impressive beaches, for its multiple leisure possibilities and sports activities, coming to Fontsanta Hotel is to be in the perfect place. Fontsanta Hotel is situated just 3 kilometres from Es Trenc, one of the most famous beaches of Mallorca due to its long stretches of dazzling sand and crystal-clear waters. With just under 4 kilometres, this beach belonging to the town of Campos is categorized as a natural reserve and protected land because on its virgin sands you can only find very few beach services and curiously enough, several post-war bunkers. The beach also has a nudist zone. Further inland there is a long stretch of forest and brush that leads into gorgeous pine trees. The name trenc originates from the word trencar which means break and refers to the canal that breaks the coastline draining the flow of inland lagoons. The quality of the water, the tranquillity and the long stretches of sand make it one of the best options for a swim in the sea in Mallorca. The outskirts of the hotel offer stunning views and small urban centers that will allow you to enjoy nature, the beach and leisurely activities. 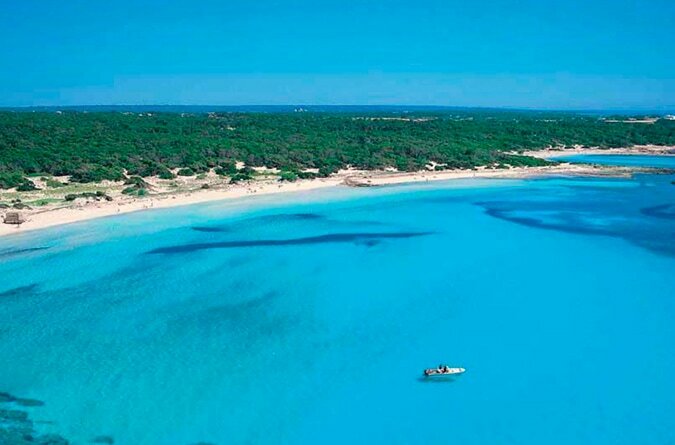 The Southern coast of Mallorca is covered with sandy beaches and turquoise waters. Es Trenc is surrounded by the beaches of Ses Covetes and the sands of Sa Rapita, permitting long walks to the shore of an always calm sea. There are also several other options: in the nearby town of Colonia de Sant Jordi one can find the beaches Es Carbo and Es Dols, that offers the almost gift-like panoramic view of the archipelago of Cabrera. Colonia de Sant Jordi belonging to the district of Ses Salines is one of the most popular summer destinations for Mallorcan families. Years ago, the population was comprised mainly of a small group of fishermen. Now in day there is a wide array of opportunities to enjoy the local gastronomy and partake in leisurely activities. Many ships headed to the archipelago of Cabrera depart from Colonia de Sant Jordi. On the ships, an interpreter serves as a tour guide and explains the great ecological value of this National Park. Less than 20 kilometres from the hotel one is able to stumble upon Mondrago, an exceptionally beautiful series of virgin coves recognized as a National Park. The most notable coves are Sa Barca Trencada, which is close to Portopetro, and more towards the south is Calo des Borgit. A small path links with the cove of Ses Fonts de n´Alis, a spectacular large stretch of sand behind which one discovers a stream that has created a large wetland. This wetland is of great ecological interest and value. In the ideal National Park of Mondrago, one can also discover S´Amador. S’Amador is a virgen cove with completely transparent waters and pine trees. The hotel is situated right next to Es Salobrar of Campos, a gathering of 130 ponds of sea water that layout in such a unique way is appears to be a playful mirror. The Carthaginians and the Romans dedicated much time is extracting the sea salt of this zone. They referred to the salt as ´white gold¨ and extracted it using very traditional methods. Because of it unquestionable ecological value Es Salobrar is categorized as a natural reserve and protected area. The flowers and wildlife have adapted to the soil that is very rich in salt. But overall, the highlight of the land is the birds, with over 1700 species identified in the area. The abundance of birds has created an environment dearly appreciated by bird watchers everywhere. For this same reason, Es Salobrar is also recognized as a zone that offers special protection for birds-ZEPA. The archipelago of Cabrera is a small paradise that was declared a National Park in 1991. It is a formation of 18 islands, however, Cabrera is the only island that is accessible. The range of the land is mainly mountainous and austere. The coastline is composed mainly of large cliffs, some larger than 100 meters in altitude, and softened by coves of turquoise waters. The land has many species of seabirds and lizards but one of the most surprising species found lives underwater: the Posidonia meadows almost touch the shoreline and offers the view of an infinite array of different fishes. This creates an absolute paradise for fish lovers. The island also boasts a tremendous castle from the XIV century. From nautical activities to cycling, going through golf, horse riding, paddle. From hiking excursions to discovering the impressive seabed ... At Fontsanta Hotel, you have practically everything. The beaches and coves along the Southern coastline of Mallorca make a stupendous zone for boating. In Colonia de Sant Jordi and the port of Sa Rapita one can find all boating services and numerous options for boat rentals. The crystal-clear water of the beaches create an almost irresistible invitation to scuba dive and contemplate the beauty of the deep sea. One of the favourite locations for scuba divers is the nearby island of Cabrera, where one can enjoy the astounding plant and wildlife. Those who love to windsurf and enjoy water sports will find many areas to partake in these activities with the stunning beaches of Mallorca as the backdrop. The nearby Salobrar de Campos is an area greatly appreciated by avid bird watchers. There have been over 1700 species of birds identified in the area, many of which use the nutrients of the natural waters to recover from their long migrations. The southern portion of Mallorca is flat and allows for long bike tours that aren´t terribly strenuous and provide the pleasure of cycling along the sea. A very popular bike path, both for professionals and amateurs, is the path that joins Ses Salines and Cap Blanc. Many are fortunate to discover this beautiful coast along the path. Some of the best golf courses on the island are near the hotel. Golf Maioris and Golf Son Antem Oeste are situated in the nearby district of Llucmajor, which is about 15 kilometers from the Fontsanta dEs Trenc Hotel. 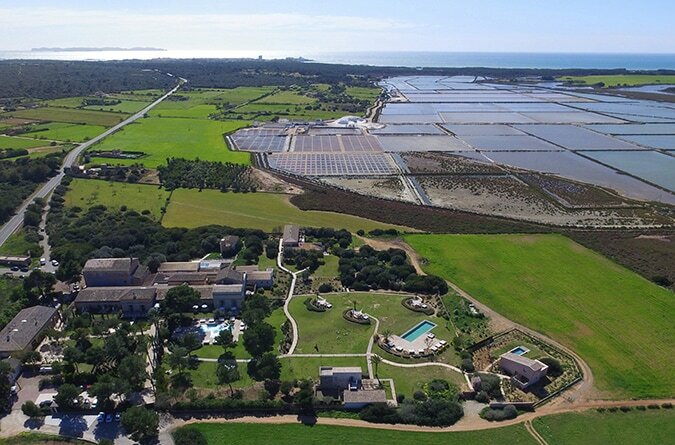 In the Colonia de Sant Jordi one can find a paddle club with a complete infrastructure and all the services and accommodations needed in order to play a great game. Enjoy long walks along the coast, the hike to the lighthouse of Cap de Ses Salines offers tremendous views. The unforgettable and unmatched beaches of Es Caragol, Es Carbo and Es Dols lay along the 12 kilometer tour, culminating in this lighthouse, which currently houses a coastal research center. There is also the option of driving to the lighthouse and then walking to the Colonia de Sant Jordi. Campos celebrates a popular market on Thursday and Saturdays. In this market, there are many arts and crafts stands, as well as clothing and jewellery merchants. Sa Rapita has a summer market in the months of July and August. These markets offer a great opportunity to admire and enjoy authentic Mallorca products. 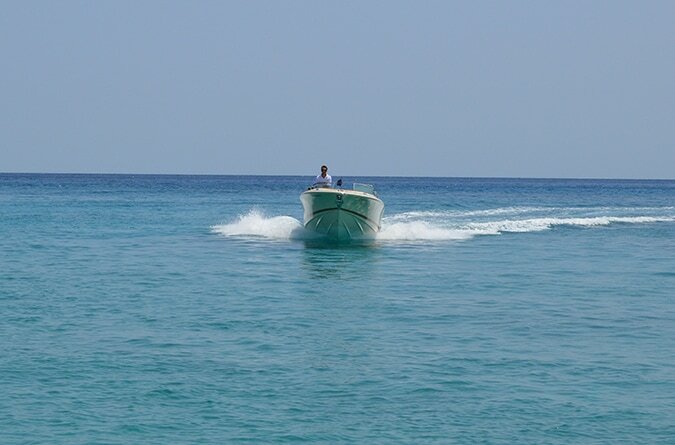 In the summer months, there are boats from Colonia de Sant Jordi to Cabrera that give daily tours. Cabrera offers a stunning National Park and amazing seaside including the famous cove, Cova Blave. To complete the trip, one can continue on the Centre of Interpretation of Cabrera, located in Colonia de Sant Jordi. In the Centre, you can discover and acquire a further understanding of the ecological treasures this area has to offer.